From Android Enterprise to zero-touch enrollment, Google has recently been taking giant strides towards the enterprise management space. Earlier this year, many of us were wondering which dessert Google would name their newest Android release after. That name turned out to be Pie, and it’s expected to be the sweetest release for enterprise management yet. In addition to supporting certain long-awaited policies, Google has also come up with a set of nifty enhancements on existing policies. Here’s a look at some of the most exciting features in Android Pie. With more organizations transitioning towards mobile-only or mobile-first enterprise setups, dedicated mobile-only policies such as APN are rising in importance. Supporting APN is especially important for government organizations, as well as large enterprises that have a dedicated private network. With Android Pie, you can remotely configure a device’s APN policy. Android Pie has introduced an important security restriction that allows admins to set a separate passcode for devices and containers, further securing the corporate workspace. Google has also gone one step beyond that by allowing admins to enforce different passcodes for a device and its container. Kiosk mode in Android has been significantly revamped to provide granular control over the Kiosk device being used for point of sale or digital signage. Among a multitude of new Kiosk-based restrictions introduced in Android Pie, error messages can now be blocked when the device is in Kiosk mode. Basic device settings can also be restricted, including the use of the notification bar, home button, power button, and task manager. Other general restrictions introduced in Android Pie include preconfiguring a device’s default time and time zone, setting the brightness, enabling/restricting usage of Airplane mode, and also allowing/disabling the screen timeout option. When provisioning devices with a profile owner or managed work profile, corporate and personal applications are listed in the same place, with apps being duplicated if they’re used both personally and in the enterprise. Though the corporate version is denoted with a briefcase, users are bound to be confused when they encounter two versions of the same app. With Android Pie, work apps are segregated into a separate section on the launcher, which can be easily accessed with a single swipe. With more and more Android personal devices moving into enterprises, one of the go-to options for BYOD management is provisioning devices as a profile owner or managed work profile. 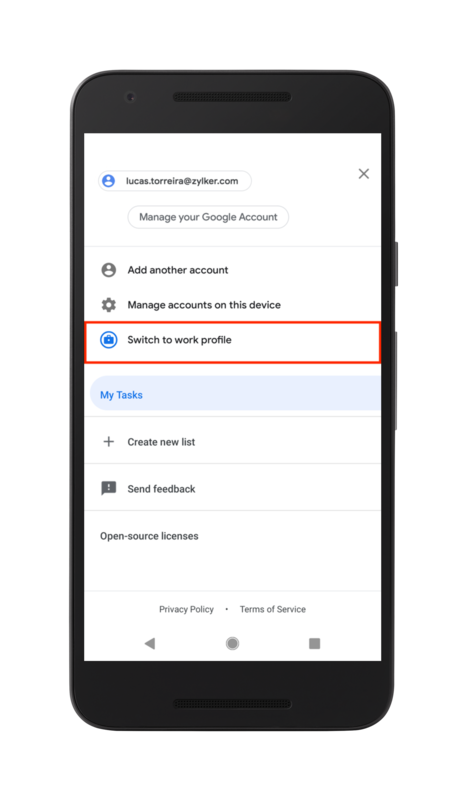 With Android Pie, employees now have the option of disabling a work profile by simply toggling a switch. This feature is bound to be much appreciated by employees, as it brings the employee work-life balance into consideration. When the work profile is always on the device, employees tend to never disconnect from work. In addition to segregating work apps into separate sections, employees can now seamlessly toggle between the personal and work accounts within each app, making the switch between work life and personal life smooth. Work apps will now be denoted by a blue briefcase rather than a red one, in tune with current Android design standards. With Mobile Device Manager Plus providing zero-day support for Android Pie, you can automate OS updates on your enterprise’s mobile devices and test Android Pie on select devices before deploying it to your entire enterprise. Try a fully-functional version of Mobile Device Manager Plus free for 30 days and get your piece of the Pie.